"During their three-day trip, the royals will be staying at the Carlyle Hotel, a favorite of William's mother, the late Princess Diana, when she frequently visited Manhattan in the 1990s. William and Kate, who are expecting their second child in April, have scheduled a full slate of events in New York, including a visit to the National Sept. 11 Memorial and Museum and a basketball game between the Brooklyn Nets and the Cleveland Cavaliers. Their visit also will include some events with other high-profile guests. Former Secretary of State Hillary Rodham Clinton and daughter Chelsea Clinton are accompanying William and Kate to a New York reception highlighting conservation efforts. The royals also are due to join actor Tom Hanks, opera singer Renee Fleming and others at a black-tie, up-to-$10,000-per-seat scholarship fundraiser for the University of St. Andrews, the Scottish institution where the royal couple met and earned degrees." 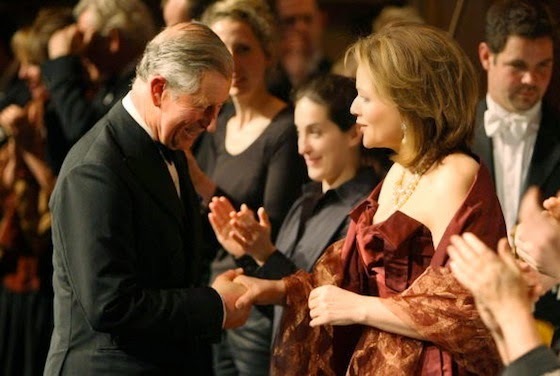 [Source] Renée Fleming is a close friend of Prince William's father, Prince Charles, and has sung for many occasions of the Royal Family. See a wonderful photo after the jump from 2008.